Jurgen Klopp’s emotional sideline outbursts have almost become commonplace since he became Liverpool’s manager in 2015. But the German displayed a new level of excitement during his team’s 1-0 win over Everton. Divock Origi took advantage of a goalkeeping mistake from Jordan Pickford, and broke the 0-0 deadlock against Liverpool’s Merseyside rivals in the 96th minute with a headed goal. 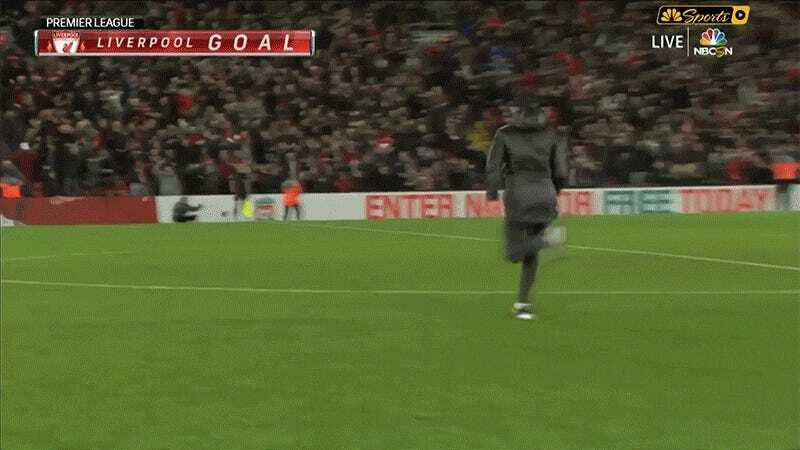 Klopp celebrated in a way only he knew how: by sprinting onto the pitch and hugging his own keeper at midfield in celebration. Per the 2011/12 Premier League handbook, Anfield’s pitch is 68 meters (74.4 yards) in width, meaning he ran about the length of an impressive NFL running play in jubilation. Hats off to the down-trodden Everton players who probably would have had every right to run up on Klopp as he entered the field of play.